Oklahoma fans can now take aim at their rivals from Texas in a unique way. The men's room at Billy Sims Barbecue in Tulsa features a toilet with an upside-down Longhorn in the bowl. 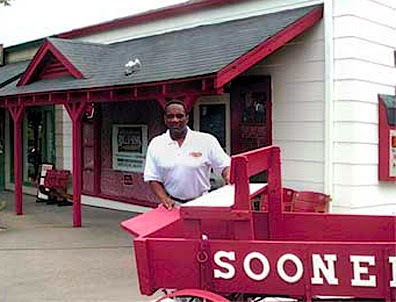 Sims, who won the Heisman in 1978 for Oklahoma, is part-owner of the business, and it appears to be gaining popularity in the Sooner State, with new locations springing up in Edmond and Broken Arrow. 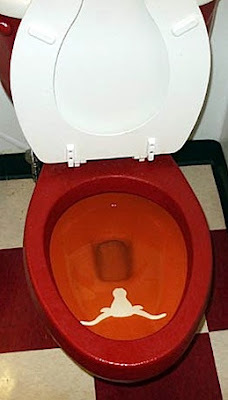 Sims' jabs at the Longhorns go beyond the men's room. The menu features a Bevo Plate (beef brisket that comes chopped or sliced) and the Texas Dog (Polish sausage). You can also order the Smoked Jayhawk (chicken breast), Mini-Huskers (corn on the cob), Pulled Razorback (pork) and the Arkansas Steak (bologna). Keith of Sooner Stats, who sent us this gem, informs us that Sims recently became Oklahoma's career rushing leader. How can this be? He says Oklahoma officials recently went back and recalculated all the rushing totals to include bowl games, and this allowed Sims to pass Joe Washington. Ohio State's Heisman winner Eddie George opened a restaurant on campus after he retired from the NFL. "In the urinals, there are Michigan footballs so you can literally go to the bathroom on Michigan." I couldn't find a picture of the urinal, but that link has an image gallery for photos of the restaurant. Does he have pictures of his kids in the toilets in his house? Didn't he pretty much crap on them by not paying his child support? If anybody happens to have the picture Mike describes from Eddie George's restaurant, please send it our way!